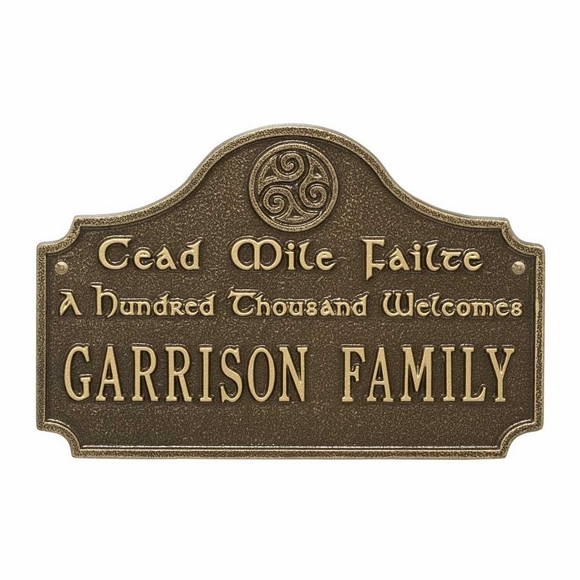 Failte Welcome Plaque with Name - - Irish theme Welcome Plaque greets guests with a sincere Cede Mile Failte. Made in USA. Wall mount. 14.25"W x 9.5"H arch shape sign. Iincludes the phrase A Hundred Thousand Welcomes; name of family or owner(s) in all capital letters (ex. GARRISON FAMILY, THE GARRISONS, SUSIE AND JIM, THE PEM'S HOME); and the Celtic Triple Spiral, which often represents the Christian Holy Trinity. Features a handmade, premium grade aluminum casting that showcases the intricate, detailed Irish design. Name line holds up to fifteen (15) characters. Character count includes spaces and punctuation. Colors: AB antique brass, AC antique copper, BG black/gold, BS black/silver" BV bronze verde, BW black/white" "GG green/gold" OB oil rubbed bronze, OG bronze/gold, PS pewter/silver, RG red/gold, WG white/gold. Large image shown in antique brass. Smaller images (from left to right): antique copper, black/gold, black/silver, bronze verde, black/white, green/gold, oil rubbed bronze, bronze/gold, pewter/silver, red/gold, white/gold. Dimensions: 14.25"W x 9.5"H x 0.375". Personalized Irish theme Welcome Plaque greets guests with a sincere Cede Mile Failte. Made in USA.